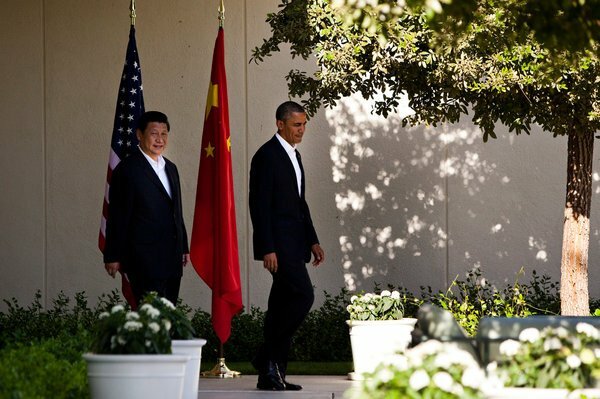 China’s President Xi Jinping and US President Barack Obama have begun a two-day summit in Palm Springs, California. The two leaders spoke of overcoming differences and forging a new relationship between their countries. Barack Obama spoke of “areas of tension” and mentioned their rivalry in the Pacific, North Korea’s nuclear ambitions, and cyber espionage. The meeting is the first between the two since Xi Jinping became president in March. The informal setting is seen as a chance for the leaders of the world’s largest economies to build a rapport amid a slew of high-stakes issues. The two men – looking relaxed and informal – met and shook hands under a shaded walkway at the Sunnylands estate just outside Palm Springs. “Our decision to meet so early [in Xi Jinping’s term] signifies the importance of the US-China relationship,” Barack Obama said. He said the US welcomed the rise of a peaceful China and wanted “economic order where nations are playing by the same rules”. He also called for both countries to work together to tackle cyber security. “Inevitably there are areas of tension between our countries,” he added. Xi Jinping said he and Barack Obama were meeting “to chart the future of China-US relations and draw a blueprint for this relationship”. US lawmakers and human rights groups have also urged Barack Obama to call for the release of 16 high-profile prisoners, including jailed Nobel peace laureate Liu Xiaobo. Xi Jinping’s US stop is the fourth leg of a trip that has taken him to Trinidad and Tobago, Costa Rica and Mexico. Accompanied by his wife – folk singer Peng Liyuan – President Xi Jinping arrived at California’s Ontario International Airport on Thursday. The summit, at the sprawling estate in Rancho Mirage, begins with a bilateral meeting followed by a working dinner. Additional talks will take place on Saturday morning. The meeting comes months earlier than expected – Barack Obama and Xi Jinping had been expected to meet at an economic summit in Russia in September. “I have the impression that both sides are willing to re-examine their premises, and to see whether they can achieve a relationship based on some perspective that goes beyond the moment – in other words that goes beyond solving immediate problems,” said former US Secretary of State Henry Kissinger. Last month the Washington Post reported that Chinese hackers had accessed designs for more than two dozen US weapons systems, citing a confidential Pentagon report. The US also directly accused Beijing of targeting US government computers as part of a cyber espionage campaign in a report in early May. China denies any role in state-sponsored hacking – earlier this week its internet chief said China had “mountains of data” pointing to US-based cyber attacks. Trade issues are also expected to be a priority, as is North Korea – which conducted its third nuclear test in February. Beijing – Pyongyang’s nominal ally – is seen as the only nation capable of bringing meaningful pressure to bear on the communist state. Other topics up for discussion may include territorial disputes in Asia and human rights in China. Activists and relatives have urged the US president to raise the issue of the “China 16” – a group of individuals detained on political or religious grounds. Analysts see the informal talks as a welcome departure from the more formal protocol adopted in US talks with former Chinese leaders. Xi Jinping is said to have developed a warm relationship with Vice-President Joe Biden after the latter’s China visit in 2011. He also has ties to the US, having spent time in an Iowa town in 1985 as a part of a Chinese farming delegation. During his US visit in February last year, the then vice-president called for deeper “strategic trust” with the US in a speech. Observers will be waiting to see whether the summit with Barack Obama will be a first step in that direction.